Millennials have the most to gain from investing – because they aren’t invested. Millennials are the most educated, the most indebted, and the future of the world. Capturing Millennial potential wealth in the stock market is extremely important from an institutional and economic perspective. Millennials are the largest generation in the US workforce and are the the largest growing customer base for companies. Gen Z is close to graduating from college, and will soon be following in the Millennial's footsteps. 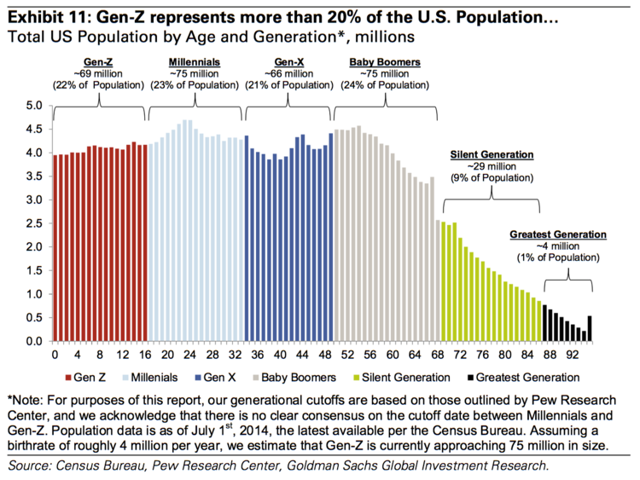 By 2025, Millennials will compose the 75% of the labor force, and soon, they will be the primary investors in the stock market as baby boomers continue to retire and Gen X heads in the same direction. But Millennials are faced with a double edged sword that prevents "easy" wealth creation: stagnant wages and underemployment. They make 20% less than their parents did at the same age. As a study done by the Young Invincibles found, ""A young adult without a college degree in 1989 earned roughly the same income as a college graduate with student debt today". The cohort that entered the job market during the Great Recession missed out on a collective $20 billion in earnings. That loss compounds over time. Home ownership is declining as well for this generation, which represents another loss of wealth. Baby boomers had twice the wealth of millennials at the same stage in life, and that disparity grows when student loan debt is added. Debt-financed degree Baby Boomers had 246% more in terms of assets, and non-debt Boomers had 183% more, adjusted for inflation. 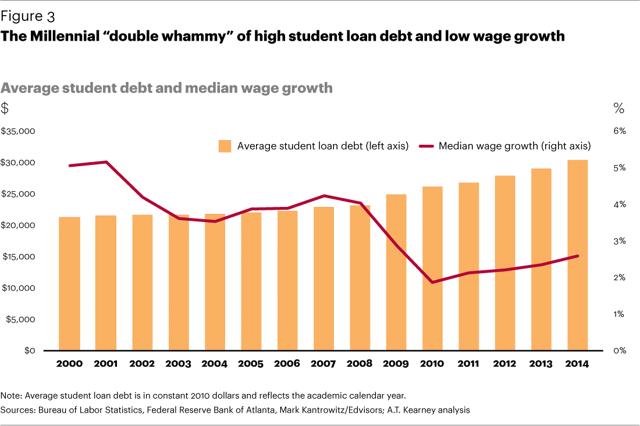 A lot of this wealth dry-up stems from student loans, which everyone knows is a massive problem. Tipping past $1.5 trillion this year, with a potential default rate of 40%, the question becomes not if the bubble will pop, but when. It will be potentially catastrophic when it happens – the average millennial has 4.4 student loans outstanding. The drag that has on wealth creation cannot be understated, with most millennials putting off major life milestones like buying a house, due to their extreme financial obligations. 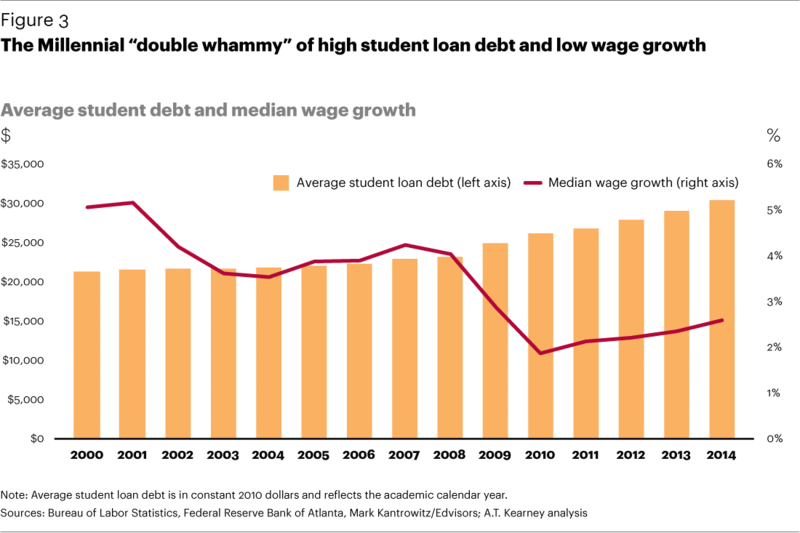 And for the first time ever, those who graduated from college with debt have a negative net wealth, dropping from $9,000 in 2013 to ($1,900) in 2017. The college wage premium doesn't exist - it's created only by the value drop of a high school diploma. You have to get a college education for most entry-level jobs in any industry, which shrinks wages overtime. Despite the debt, Millennials represent $1.3 trillion of spending annually and they are 75 million strong in America. That's a very large potential market, and they poise a lot to gain from investing. The only problem – Millennials don’t invest. 77% do not have an advisor, and only 39% actually want one. Only 38% are in their workforce retirement plan, with 41% having no retirement savings at all. The biggest problem is Millennials don’t believe in the stock market. 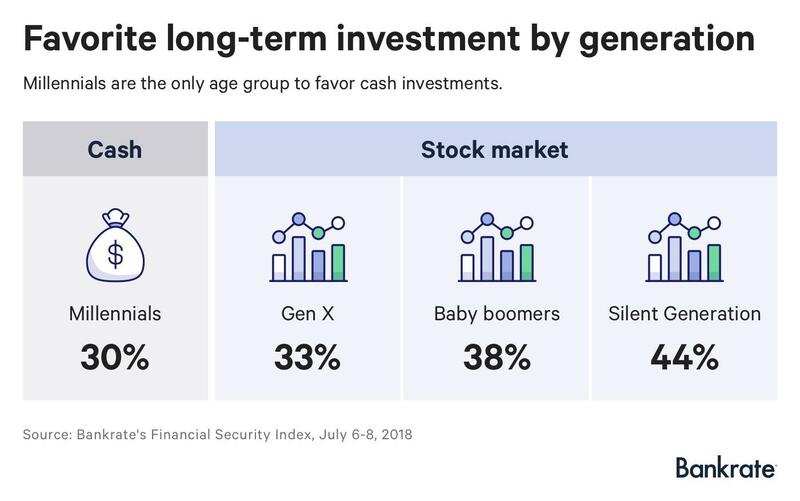 Less than 25% of millennials see the stock market as a long term store of value, with the other three quarters favoring cash, real estate, gold, and bitcoin. The most surprising thing? They are the only generation that thinks this way. All the previous generations have preferred the market. It makes sense: Millennials lived through the Great Financial Crisis and the Tech Bubble. They saw the instability of investments, and they saw the overwhelming loss that can happen. 70% of Millennials distrust stock market experts due to the after-math of the effects of the Recession. That’s why they keep money in cash, or stick it in safe investments like bonds or money mutual market funds. 52% of Millennial's money is held in cash, whereas only 23% of the preceding generations held onto cash. They are extremely risk averse. This type of decision making will compound into a loss overtime. If they put 10% of their high-ball estimate $65,000 salary into a bond fund through their 401k, yielding 2.5% every year for 50 years, then they would have $671,831 for retirement, assuming annual compounding. If they invested in the market index, which returning a low-ball estimate of ~8% annually, that would amount to $4,332,727. A cool difference of $3.5 million. 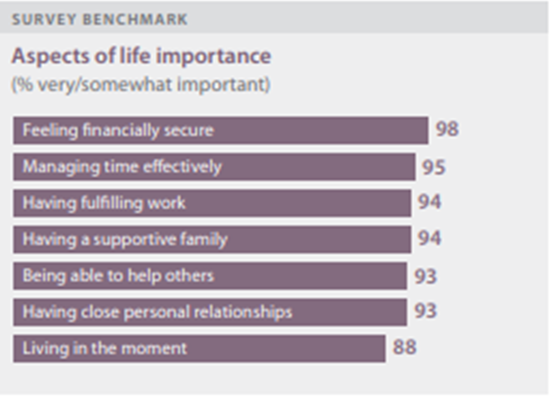 98% Millennials believe that feeling financially secure is important to their life, actually ranking it above that of fulfilling work and supportive family – but only a third are actually satisfied with their financial life. And most of that stems from the intimidation factor of financial skills of knowing how to invest, knowing how to budget, and knowing where to start. This is the most educated generation in history. Yet, only 39% could define the function of the stock market, 50% don’t understand compound interest, and 53% say they will never be comfortable investing in the market, according to a survey released by Wells Fargo. There is a large knowledge gap. 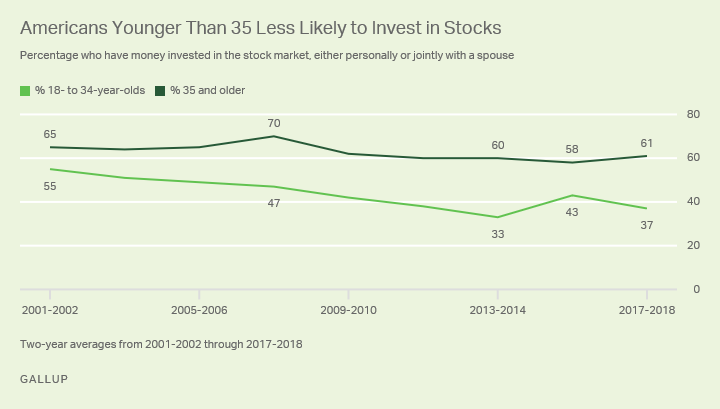 52% of those younger than 35 were invested in the market pre-2008, and that has significantly dropped over the recovery. 43% were invested in 2015, and that number has shrunk to 38% in 2017 over the length of potentially the most prosperous part of post-crash. For comparison, 66% of those 35 and older were invested pre-2008, and 61% are invested post-crash. 26.9% of those under 35 stopped investing, versus 7.6% of the older generation. That's a large disparity, and it contributes to a large wealth gap. This is problematic for several reasons. Millennials don't tend to use advisors. Consulting peers and using social media are popular ways to check out recommendations, highlighting how important millennials find the intersection of technology and communication. Despite the skepticism of traditional advisors and the lack of investment in the market, 84% of Millennials still seek financial advice, just in different channels. The issue that is created here is that millennials have a distrust of the financial system, but don’t know how to invest. So they end up netting zero, like we saw above – missing out on mass amounts of wealth creation due to 1) uncertainty of the industry and 2) lack of education to invest for themselves. This article is written by a Gen Z / Millennial. I'm right on the edge of both generations. This generation's financial security is your financial security. My generation is the next generation. We are the future. And we are the most educated, most diverse, and most indebted generation in America’s history - and we have no idea how to invest in the market. And we desperately need to learn. This next generation are the ones that will truly create and sustain wealth in society. They are the ones that will aid in determining what policies are enacted. They are the ones who will determine the economic direction of our world. There are several things that we can do to change the knowledge gap, starting with encouraging financial literacy, starting from a young age. Make it a requirement. A section on standardized testing. A part of the job application. An evaluation when applying for colleges. The second things we can do is create accountability. This generation isn’t going anywhere, and they can have money to invest, if they learn how to manage it correctly. The wealth gap will only get worse if something is not done. This will be the challenge that the industry has to take on to ensure it's future - with two-thirds of wealth mangers' clients over the age of 60, it's time to embrace the new generation. Encouraging self-directed investment is important with Millennials. Creating a portfolio that focuses on ESG investing, and provides for the millennial risk-reward tolerance. Technology will have to improve to capture them at every point in the investment cycle, which will also work to improve the efficiency and capacity of the overall industry. Millennials have a vastly different investment style, and institutions who learn how to adapt to it will do very well. There are 75 million Millennials and a wealth transfer of ~$30 trillion. 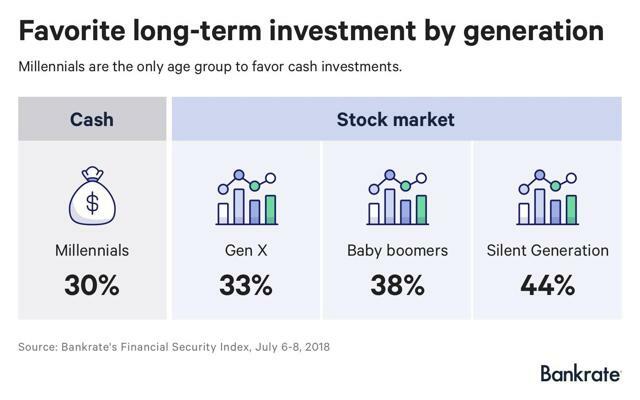 Currently, 3 in 5 are not invested at all, and they believe in UFO's more than they believe in the future of social security. It's time to change the investment conversation. That's not even including the Gen Z generation, who will soon overtake Millennials in numbers. Nearly 70% of this Gen Z considers themselves "self-employed" and are more money-oriented than their predecessors. That's a lot of generational alpha to be captured.